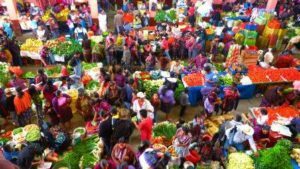 Because of its vibrant and cultural atmosphere, authentic local crafts, and warm people, the market in Chichicastenango has become a main attraction in this quaint town of Guatemala. 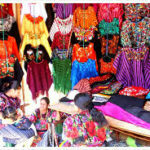 Chichicastenango has always been a town of commerce, where buying and selling is the way of life. So it is not surprising that one of the biggest markets not only in the country, but also in South America, is set up here. Chichicastenango, fondly called “Chichi” by locals, is not too far from Guatemala City, about 87 miles (139kilometers) away. The closest airport to the town is the Guatemala City International Airport. Chichicastenango is in fact, a mountain village located at about 6,447 feet (1,965m) above sea level. You will need a couple of hours to reach it via public transport because you will have to go through winding mountain roads. 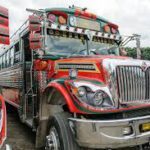 For an authentic cultural travel experience, take the local bus, called “chicken bus” from the major cities of Guatemala and Antigua. Another option is to book a tourist shuttle to Chichicastenango, if you want the journey to be faster and more comfortable. 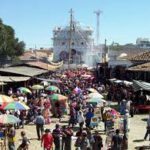 The Chichicastenango market is held every Thursday and Sunday, so it’s ideal to reach the town on a Wednesday or Saturday night, before the designated market days. On the days before the market, several people from the surrounding towns make their way to Chichicastenango to set up their stalls. These vendors tend to sleep near their stalls until the early morning, despite of the chilly evening air. The town’s usual modest population of 45,000 swells up during the market days, ensuring that your shopping experience in Chichicastenango won’t be dull at all. While walking around Chichicastenango market, you will immediately notice many locals wearing their colorful traditional clothes. The products you will find here are also a reflection of the quintessential Guatemalan culture. Whether you are seeking household supplies, fresh produce, woven textiles, pottery, wood carvings and masks, you can be sure that you will see it in Chichicastenango’s markets. One of the most popular items to look for is women’s blouses as most of them are made with very high quality. If you would like to get great deals, start shopping in the early morning before 10 AM, and before the tour buses arrive. Once more tourists come, the prices tend to go up. Don’t forget to bring small quetzal bills so you can easily make payments and haggle effectively. When taking photos of vendors and villagers, be respectful and ask their permission first. To get away from the crowd, don’t linger around the crafts stalls that populate the main square but rather head towards the area that is closer to the highlands. If you want to take great photos of the market, go to the indoor balcony of the Centro Comercial building, situated at the market’s northern end. The balcony provides excellent views of the market, including the colorful products, the villagers, vendors and tourists. After exploring the market and before heading back, consider dropping by some of the Chichicastenango’s prominent landmarks such as the 400-year old Santo Tomas Church (Iglesia de Santo Tomas), and the colorful cemetery that serves as a religious site for both the Catholic and Maya cultures. Click Here for a map of Guatemala!